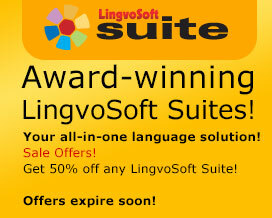 LingvoSoft Learning Voice PhraseBook English <-> Russian for Windows is part of LingvoSoft Suite - the complete language solution available only from LingvoSoft. With thousands of practical and useful phrases now at your fingertips, learning another language is easier than ever before. LingvoSoft Learning Voice PhraseBook English <-> Spanish for Windows is part of LingvoSoft Suite - the complete language solution available only from LingvoSoft. With thousands of practical and useful phrases now at your fingertips, learning another language is easier than ever before. LingvoSoft Learning Voice PhraseBook English <-> French for Windows is part of LingvoSoft Suite - the complete language solution available only from LingvoSoft. With thousands of practical and useful phrases now at your fingertips, learning another language is easier than ever before. LingvoSoft Learning Voice PhraseBook English <-> German for Windows is part of LingvoSoft Suite - the complete language solution available only from LingvoSoft. With thousands of practical and useful phrases now at your fingertips, learning another language is easier than ever before. LingvoSoft Learning Voice PhraseBook English <-> Italian for Windows is part of LingvoSoft Suite - the complete language solution available only from LingvoSoft. With thousands of practical and useful phrases now at your fingertips, learning another language is easier than ever before. LingvoSoft Learning Voice PhraseBook English <-> Polish for Windows is part of LingvoSoft Suite - the complete language solution available only from LingvoSoft. With thousands of practical and useful phrases now at your fingertips, learning another language is easier than ever before. LingvoSoft Learning Voice PhraseBook English <-> Portuguese for Windows is part of LingvoSoft Suite - the complete language solution available only from LingvoSoft. With thousands of practical and useful phrases now at your fingertips, learning another language is easier than ever before. LingvoSoft Learning Voice PhraseBook English <-> Chinese Mandarin Simplified for Windows is part of LingvoSoft Suite - the complete language solution available only from LingvoSoft. With thousands of practical and useful phrases now at your fingertips, learning another language is easier than ever before. LingvoSoft Learning Voice PhraseBook English <-> Greek for Windows is part of LingvoSoft Suite - the complete language solution available only from LingvoSoft. 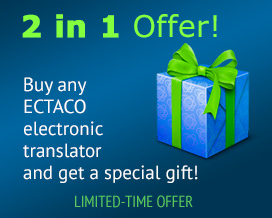 With thousands of practical and useful phrases now at your fingertips, learning another language is easier than ever before.